This USB universal TV capture device turns your PC into a TV and video recorder and empowers your PC with video/audio inputs so you can watch analog cable channels or import audio/video feeds from home A/V devices to the computer for visual entertainment, multimedia applications and post production. 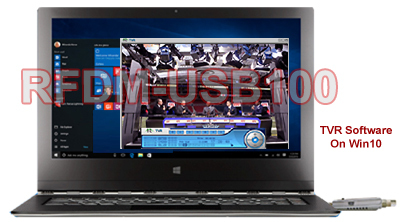 Users can record TV shows instantly or by advanced scheduling PC hard drive. The bundled TVR software provides users with a versatile set of DVR functions, which means no more missing out on favorite TV show ever again. This USB analog TV stick also provides composite RCA video and stereo audio input just like what a regular TV has so users easily capture video/audio feeds from VCR/DVD player, game console, camcorder, surveillance cam into digital MPEG formats for playback, collection, editing or disc production. 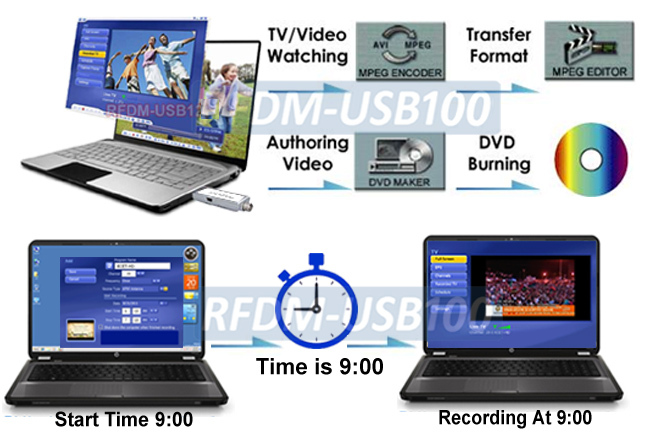 This USB TV DVR adapter full supports all Windows OS including Win10, Win8.1/8, Win7, Vista and XP. The RF input of this TV tuner supports worldwide analog TV RF frequencies and standards including NTSC, PAL B/G/D/K/I, PAL M/N and SECAM. It can decode those UHF, VHF and CATV channels within the range of 48.25 to 883.25MHz. This USB TV video adapter provides users with a cost efficient solution for decoding coax feeds from cable outlet, cable box, satellite receiver, surveillance DVR or coax modulators into digital MPEG format for viewing or recording through the USB connection with a PC. The RF input of this coax to USB adapter can also be used for those satellite set top box with with TV out from DirecTV, Dish Network and other free-to-air satellite boxes. This USB TV unit is also video frame capture device. Any composite video device such as camcorder, media player, game console with composite RCA video output can be connected to a laptop or desktop PC and start seeing and recording video feeds into the hard drive for playback later, web broadcasting, editing or post production. This USB A/V adapter is also a great tool for for digitizing analog video contents into digital format for collection. User can use this USB video adapter to import the video feeds from VCR or DVD player into your computer and save them in digital MPEG files for storage or further video works such as adding the captured video feeds and image files to Powerpoint or upload video clips to Youtube for broadcasting on the internet. This USB TV adapter is also a simple DVR solution for displaying live security camera pictures on a PC screen. Users can connect any CCTV surveillance camera, wireless camera, microscope camera or camcorder to this USB adapter installed in the PC so they can start seeing and recording camera feeds into the hard drive for playback later, web broadcasting or burning onto disc for storage. This USB TV tuner also doubles as an advanced PC-based digital TV recorder. The bundled TVR software provides users with a versatile set of DVR functions such as, time-shifting, instant recording, programmed recording and so on. Users can easily configure their PCs to record cable TV programs with advanced scheduling on any particular day, daily or weekly. Users may also pause live TV feed with time-shifting function (timed delay recording). Play back the recorded live TV feeds and skips the commercials. This USB TV device can be fully operated and controlled via mouse click or easy remote controller to flip through channels, turn up/down sound volume, mute, playback, pause and so on. This USB A/V adapter is also a great tool for digitizing analog video contents into digital files. This device also supports picture-on-picture function, meaning that users can watch TV, DVD or recorded video playback and work on the computer at the same time. The TV video window screen can always stay on top of the computer screen. TV video window can be set at 16:9 wide-screen and 4:3 ratio. This TV video window can be moved to any location on the computer screen and the TV screen size is resizable and up to full screen for display. A shut-down button on the remote of this USB TV unit allows users to safely exit Windows and turn down the PC without clicking the mouse around. Users may also set up in the TVR software with advanced scheduling about when to shut down the computer automatically. 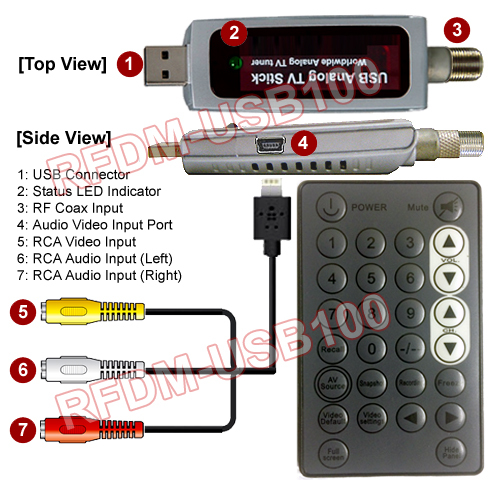 Advanced composite RCA video audio to USB converter with digital MPEG video recorder function. Supports all RF coax and analog video devices such as cable outlet, cable box, satellite receiver, DVR, VCR, DVD player, game console, CCTV camera, camcorder and so on. Smooth video/audio streaming through high speed USB 2.0 connection. 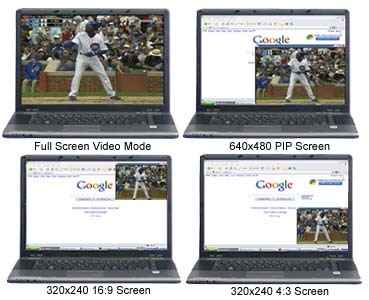 TV video windows can be positioned and re-sized as desired on computer screen. Supports 16:9 wide-screen and 4:3 SD ratio for the sub video window size. Supports customizing favorite TV channel list. Video recording in AVI, MPEG1 or MPEG2 format. Supports snapshot function to take still pictures of video theme. Full-function IR remote controller included for easy operation. Supports auto shut-down of PC per scheduled timer set in the software. Supports Win 10, Win 8.1/8, Win 7, Vista, XP systems. Video Color Element Control: Adjustable video color elements for picture brightness, contrast, saturation and hue.